Colin McCahon was one of New Zealand’s greatest painters. A risk-taker and nonconformist, he engaged with questions of religion, faith and the human condition through his art. Born in Timaru in 1919, McCahon first realised he wanted to paint when he watched a signwriter working on a tobacconist’s shop window. As a high school student he was inspired by Toss Woollaston’s first exhibition; the celebrated landscape painter became a lifelong friend and mentor. 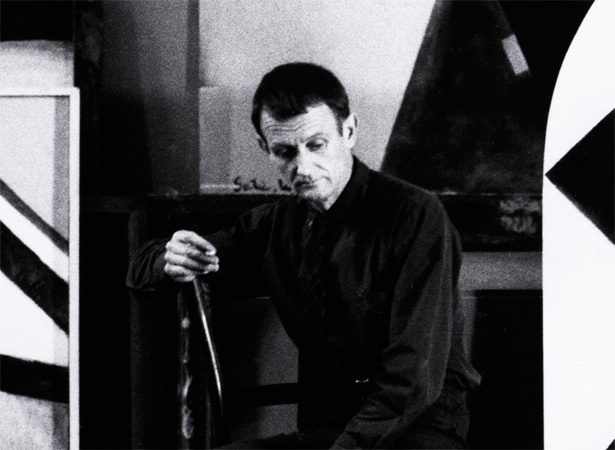 McCahon trained at the Dunedin School of Art and received a Carnegie Grant to study in the US in the 1950s, but was otherwise largely self-taught. A common thread throughout McCahon’s career was his exploration of Christian themes. His art, which he claimed was autobiographical, traces a personal spiritual journey. It reveals a slow transition from faith to doubt, with the final paintings of the early 1980s expressing a sense of despair. One of McCahon’s great frustrations was people’s failure to understand his paintings. His desire to communicate ideas led to his innovative use of words, speech bubbles, numbers and Christian symbols in his art. McCahon resisted explaining his meaning, even to his family and friends; he wanted viewers to rely on the visual cues. For many, though, his paintings remain as enigmatic as they are compelling. Colin McCahon’s paintings continue to inspire discussion and research. They are held in major public and private collections throughout the country and overseas. We have 7 biographies, 2 articles, related to Death of Colin McCahon.